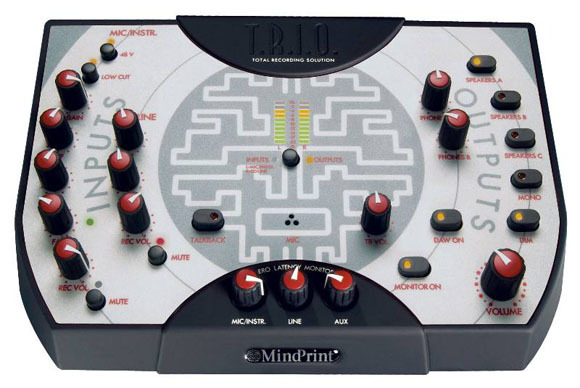 Mindprint Trio: Audio Interface/FX Good for Mobile Music? A USB audio interface these days is about as exciting as a pair of knee socks, and unlike the latter, you don’t really need multiples. But this particular box is actually interesting. First, the Trio delivers all the hardware effects you’d need in a channel strip: mic inputs, low-cut filter, “vintage” 2-band EQ, compressor. And there’s plenty of I/O here, connecting via USB 2.0. Second, this box has what’s missing on so many audio interfaces: three assignable speaker outs and two separate headphone outs with headphone amps. Mindprint is marketing this as a recording solution, but I’m skeptical. Processing before recording can cause problems when mixing and mastering; better for those of us who don’t know what we’re doing as a recording engineer (I’ll hold my hand up here) to add effects non-destructively in software. But as a live performance interface, this thing is brilliant. You can tweak the effects you need most, like compression on your vocals, and use them live in-hardware. And having separate headphone outs and speaker outs is perfect for setting up monitors or monitoring a laptop mix with headphones for cueing and the like. Finally, if you want to leave the laptop offstage, this functions in standalone mode. Coming next month; US$549 – GBP 329 – EUR 449.